“It gives me immense pleasure to be here amidst you on the occasion of laying the foundation stone for the redevelopment project of Lady Hardinge Medical College. This College, which is approaching its centenary, is a unique institution of our capital city. Its founding, more than three decades before India’s independence, is steeped in the history of that era. It reflected not only a major step in the advancement of medical education, but also in redressing the yawning gender imbalances since it provided, for the first time, an exclusive facility for women in the field of medical education. 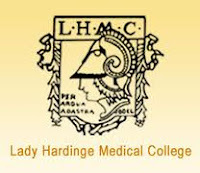 From modest beginnings nearly a century ago, Lady Hardinge Medical College has today evolved into a premier medical institution, of our country providing excellent medical education to women and catering to the medical needs of large numbers of patients, especially the poor. I sincerely hope that the augmented facilities being put into place will contribute towards the further development of the College and its connected hospitals. The old adage about health being wealth is truer than ever ago. The health indicators of our nation have a great bearing on our overall social and economic well-being. I am therefore very happy to note five heartening developments in the field of health care in recent years in our country. First, recognizing the need to provide for the complex challenges in the health sector, the allocation for the health has been enchanced some three times in the 12th Five Year Plan as compared with the 11th Plan allocation. In addition, factors such as nutrition, safe drinking water, sanitation, housing and education, particularly education of the girl child, are increasingly being underlined as the social determinants of health. We have therefore laid a great emphasis on their importance by providing adequate thrust to these sectors in the plan allocations for the 12th plan. Second, we are devoting greater attention than ever before to medical education. From one All India Institute of Medical Sciences in New Delhi, we now have six such institutions of excellence that have come up in Bhopal, Bhubaneswar, Patna, Jodhpur, Raipur and Rishikesh. I am very happy that classes for undergraduate students have already started in these institutions for the current academic year. It is also heartening to note that, in the last three years, under the guidance of my colleague Shri Gulam Nabi Azad, the number of MBBS seats in medical colleges in our country has increased by over 30% and the post graduate seats have gone up by nearly 51%. As many as 61 new medical colleges have been added, raising the total number of such institutions in our country to 362. In addition, 269 new nursing schools have been sanctioned, mostly in remote, inaccessible and under-served districts. This will go a long way in overcoming the shortage of nurses and Auxiliary Nurse Midwives. However, the availability of trained human resources in the health sector remains a challenge. We need to set up more nursing and medical colleges to increase both undergraduate and postgraduate seats in the 12th Plan. We also need to pay much greater attention to improving the volume and the quality of faculty in medical institutions in our country. To give a boost to para-medical education and scale up the availability of para-medics, the Government is also setting up a National Institute of Paramedical Sciences at Delhi and eight Regional Institutes of Paramedical Sciences at Chandigarh, Lucknow, Bhopal, Hyderabad, Coimbatore, Bhubaneswar, Patna and Aurangabad. I hope that all these new institutions will pay adequate attention to developing institutional governance frameworks so that they can be managed in the best possible way and deliver lasting value to our people at large. Third, a major urban health initiative will be launched in the 12th Five Year Plan in order to focus on the specific health issues of the urban poor. For best results, this initiative will demand a high degree of synergy and coordination between the Ministry of Health & Family Welfare, the Ministry of Urban Development and the Ministry of Housing & Urban Poverty Alleviation. Fourth, the latest Sample Registration System findings have shown that India’s Infant Mortality Rate has declined by a further three points during the last one year. This is a good news but we still have much to achieve on this front where we lag behind a number of other developing countries. I hope that efforts to bring down the Infant Mortality Rate will continue with renewed energy and focus. If the same energy and commitment that was brought to the effort to eradicate polio from India could also be brought to reducing Infant Mortality Rate further, our demographic indicators would certainly appear much better. Finally, I am very happy to note that free generic drugs will be made available to people through all public hospitals in our country. This will certainly help in reducing the out of pocket expenditure of the poor on health across the country. I have no doubt that the redevelopment of Lady Hardinge Medical College will enable our doctors and other health professionals to provide the best healthcare to our people. It will also help the College emerge as a centre for development of advanced skills and research. I am sure that present and future alumni of this great institution will continue to play a leading role in providing our nation with committed and talented lady doctors.